Angelique Pritchett, M.D. 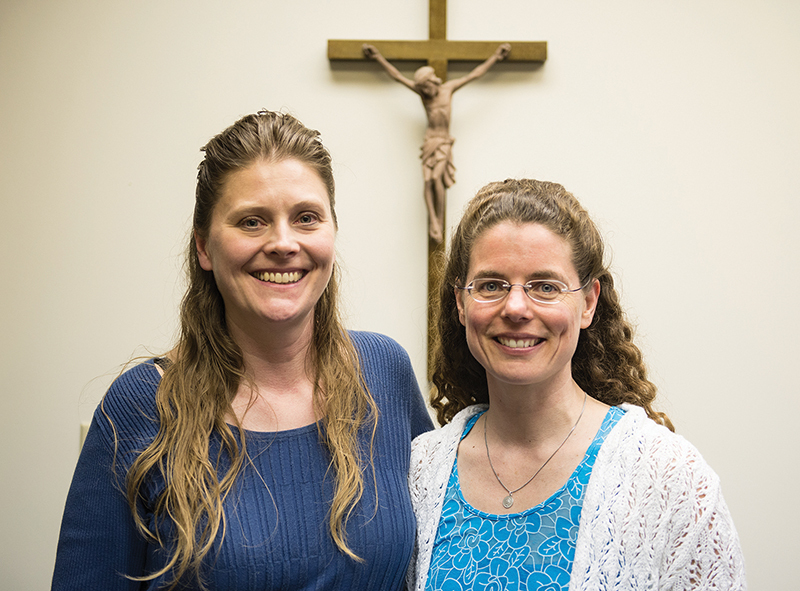 (left), and Terese Bauer, M.D., both board-certified in family medicine, were inspired to found a clinic that would offer quality medical care with a Catholic ethos. Their business model seeks to lower health care costs by offering various clinic membership plans. SHAWNEE — It’s rare that an archbishop will bless a new medical clinic. Then again, it’s also rare that a new medical clinic has a prayer room. 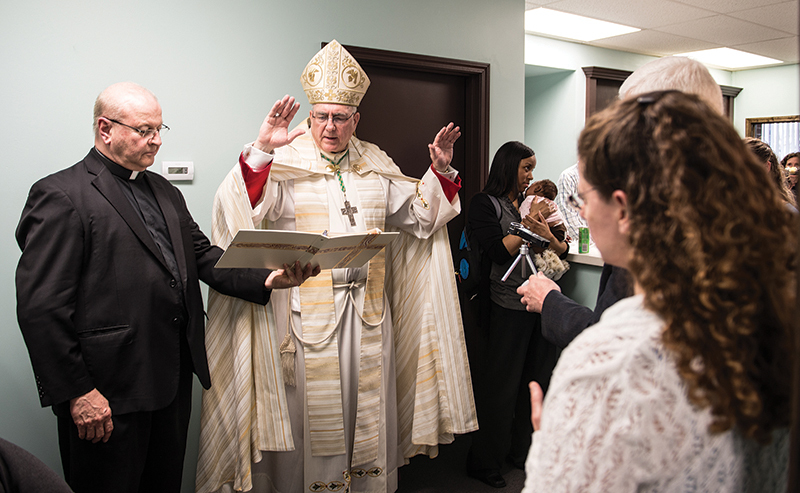 Archbishop Joseph F. Naumann did such a rare blessing at the grand opening on April 1 of the Gianna Family Care clinic, located at 10820 W. 64th St. in Shawnee. The clinic is owned and operated by Terese Bauer, MD, a member of Our Lady of Good Counsel Parish in Kansas City, Missouri, and Angelique Pritchett, MD, a member of St. Peter Parish in Kansas City, Missouri. “I’m grateful to [Dr. Pritchett and Dr. Bauer] for their courage and willingness to take a leap of faith, in some ways, in establishing this practice,” said Archbishop Naumann. “We pray that it will be blessed, and those who associate with them and work alongside of them — and support them in their work as physicians — will get glimpses of how God is using them to care for those entrusted to their care, and to use them as instruments of healing,” he added. Gianna Family Care is in most respects like any other clinic or doctor’s office. But there are at least two big hints that this clinic is like few others: its name and its prayer room. The clinic is named for St. Gianna Beretta Molla, an Italian wife, mother and pediatrician who died in 1962 and was canonized in 2004. During her fourth pregnancy, she developed a fibroma on her uterus. She refused an abortion or hysterectomy, which would have saved her life but killed her child. She died a few days after giving birth. In regard to the prayer room (or oratory), prayer and faith are integral components of the doctors’ work. “There are some physicians who happen to be Catholic, but, as a distinction, we are Catholic physicians,” said Pritchett. “In all aspects of the care of our patients, we want to address not just their physical healing but also their emotional and spiritual healing as well. The focus of the clinic is primary care, or family medicine. Both doctors are specialists, or have special training, in obstetrical, gynecological and reproductive care. Gianna Family Care grew out of both doctors’ desire to integrate their faith and work . . . and to follow God’s will. Pritchett moved to the area in 2004, and Bauer moved here in 2007. They learned about each other through a mutual friend and medical colleagues. When Bauer became pregnant, she asked Pritchett to care for her and deliver her child. “Over the course of all those visits, we got to know each other, and I experienced a call from the Lord to work with her,” said Bauer. Pritchett, in the meantime, felt a growing restlessness in the practice she belonged to at the time. They had their first meeting in January 2015 and began to build a business model. They structured it to be a direct primary care clinic, which means they do not accept health insurance. Rather, patients pay the practice directly through membership fees. For more information, contact Gianna Family Care at (913) 890-2555; by email at: info@giannafamilycare.com; or visit the website at: www.giannafamilycare.com.